When you really think about it, the fact that children learn a language, learn how to speak, and learn to write in such a short amount of time is extraordinary. As parents and caregivers and educators, we all want to encourage our children to learn the skills they will need for a lifetime, but many of us don't necessarily think a lot about how those skills develop—or at what age we can encourage our children to start learning how to write. When Do Children Learn to Write? We might think that children don't really learn how to write until they approach older ages, like my son, but a study conducted by Washington University in St. Louis uncovered some interesting findings that prove otherwise. The study, which was published in the journal Child Development, showed that children actually start to learn writing skills as early as the age of three. Previously, child development experts had assumed that children learned how to write only once they learned what sounds represented each letter. So, for example, once a child learned what "A" sounds like, he/she can connect that sound to a letter and from there, start to write the letters that are representing the sounds they hear. Instead, this study found that children actually learn fundamentals of writing before they learn what letters represent specific sounds. The study's co-author Rebecca Treiman, a professor of psychological and brain sciences, explained that the study showed that children actually display knowledge about the formulas of written language, such as which letters are usually grouped together before they learn what those letters actually represent. Their young brains are recognizing patterns in words they may see in a book, even before they know what those patterns mean or what the words mean. This study, unlike other studies that examined how children's writing skills improve as they get older, looked at how early children actually learn how to write. The researchers found that children begin to write "words" that actually follow rules of the written language, as early as age 3. For example, they might write a word that makes no sense, but it might actually follow a basic rule of looking like a word with repeating letters that represent vowels or word types. Treiman's study looked at spellings of "words" from 179 children in the U.S. between the ages of 3 years 2 months and 5 years 6 months who were "prephonological" spellers; this simply means that they spelled words with letters that had no connection to the sounds of the letters in the actual words. What they found was that when asked to spell a word like, "cat," for example, an older child may not be able to write any letters that actually sound like the letters in the word, but he/she recognizes that "cat" is a shorter word than say "elephant" and writes down their word accordingly. This skill improves as the child gets older, so the 5-year-olds had much better ability to write words that looked like words than the preschoolers. The researchers based what looks like a "word" on a few standards, which included: length of a word, using different letters within the words, and how they combined the letters within the words. According to the researchers, this particular study is an important look at how children learn how to absorb the basic rules of reading and writing at younger ages than previously thought. Knowing this allows parents, caregivers, and educators to better teach young children the foundations of language, giving them a better start on life-long learning. The study's co-author also pointed out that the findings might help educators develop a plan for identifying any potential learning disabilities early on too. Children who may have any learning challenges benefit from early intervention, so identifying those challenges as early as possible could be very helpful. While you don't have to worry about hosting a handwriting class with your little one, you can definitely get started on introducing writing skills to your toddler if you would like. You may be curious to see how your toddler approaches reading and writing, if he/she will naturally gravitate towards a love of language, or if you anticipate any problems. But of course, keep in mind that kids change quite a bit from the toddler years to school-age years too. Consider your toddler's motor development. If your toddler is following typical motor development, you can check his or her skill development timeline to see what he/she should be able to accomplish by age. If your toddler is too young to hold a crayon, for example, it may not be time to start introducing words just yet. 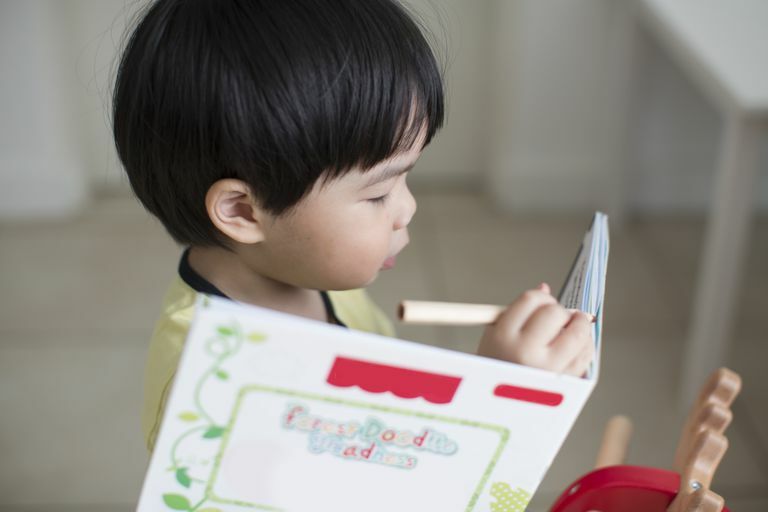 Provide larger crayons, markers, or pens for your toddler to grasp. A three-year-old with typical development should be able to hold and color with a regular crayon, marker, or pencil, but a younger child may benefit from a larger crayon with a more stable base. The larger design makes it easier for the toddler to hold and start to draw on paper. Give them freedom. Although it may seem tempting to try to lead your toddler into becoming a wordsmith by age two, one of the best things you can do for your child is to simply step back and let her explore what it means to write all on her own. She may imitate you or try to write words from her own books, but rest assured that play is the work of childhood and your little one is always learning best through free play. Teaching your child to write begins at an early age. You can help boost your child's hand-eye coordination by introducing crayons or other writing tools at an early age, sitting down with your child to spell out words and talk about them together, and give your child room to explore writing. Even if the "words" your children write look a bit like gibberish to you, they are important first steps to learning how to communicate through the written language, so encourage him or her to write often. And as always, the single best thing you can do for your child at any age is to read together. You can take turns reading to your child or have your child "read" to you, but either way, studies show that reading together helps all aspects of communication, language development, and future abilities. Plus, reading is always a fun activity to do together. You can't go wrong with reading and it's interesting to see how studies are showing us that there is more development happening at even very young ages then we realize. Introducing language skills, in the form of reading or writing may also help identify any potential learning challenges early on as well.